In a Houston Chronicle opinion piece titled, “Houston schools deserve facts, not ideology,” our Houston ​Federation of Teachers Zeph Capo sums up perfectly why its important to stay the course on well-researched strategies to improve schools–including the community schools initiative we are working on in Houston ISD. His editorial was in response to a tweet from Gov. Greg Abbott saying the district “deserves” to be taken over by the state. There are facts and then there are ideological positions. In the chaos and name-calling over Houston Independent School District schools, it’s best to stick with facts — accurate portrayals of the state of our public schools and what works to lift student achievement. Promoting ideological beliefs not grounded in facts will get us nowhere and does a disservice to our students and community. Gov. 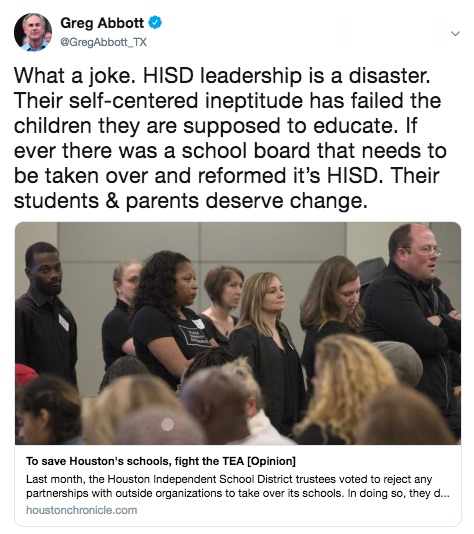 Greg Abbott’s inaugural foray into Houston school issues was quite a doozy of a tweet, criticizing HISD leaders’ “self-centered ineptitude” and pushing his go-to ideological position for a state takeover of the district’s school board and privatization of low-performing schools. All this despite the fact that the District was rated a “B” overall by the accountability system he signed into law just last session. In no school district does a “B” mean failure. State takeovers of school districts and privatization of public schools have poor track records. A 2015 report by the Southern Education Foundation and the Annenberg Institute for School Reform found that state takeover models have not proven effective, noting they overwhelmingly target African American and low-income communities and are usually promoted by charter advocates itching to take over traditional public schools. The report studied state takeovers in Louisiana, Tennessee and Michigan and concluded none demonstrated sustained improvement in student outcomes across the board. Here in Texas, the El Paso Independent School District was taken over in 2013 after a cheating scandal and in two years the performance gap widened and post-secondary readiness plummeted. Here are the facts for Houston. While we can’t declare mission accomplished, there has been significant turnaround of low-performing schools that, not coincidentally, correlate with the end of HISD board policies that Abbott promotes. These include ending a local accountability system that was test-focused and punitive, and rejecting explicit support of privatization of schools pushed by charter school networks. Houston has been able to reduce the number of schools failing to meet state academic standards from 58 in 2015 to 21 in 2018 — accomplished despite some unfortunate kerfuffles in board meetings and the sad fact that the district has been without a permanent superintendent since March. Imagine what could be accomplished without the drama and with a permanent superintendent who understands what students need and how to get there. Another fact is that local school boards are elected by the people and not intended to be taken over by a governor. State takeovers of boards or individual schools do not have a strong track record because they are often mere Trojan horses to push an ideological whim without tangible improvement plans. After decades of experience with vouchers, for-profit charters and state takeovers across the country, the research is clear: They fail most of the children they purportedly are intended to benefit. We need to get serious and agree on an improvement plan comprised of programs with proven track records. Our focus should be on giving all students, especially those in low-performing schools, the sorts of resources and programs that have worked at other campuses in boosting student success. Instead of perpetuating drama over renaming schools and other incidental issues, let’s focus on what’s working and what we need to continue to pursue. For example, we have started developing true community schools and investing in teachers by increasing embedded time for collaboration and development. These initiatives have already made a real difference in reducing the number of Improvement Required (IR) schools and, if expanded, will help all Houston students and teachers. Community schools provide programs to help students overcome the consequences of poverty, such as food and clothing banks, health clinics and access to counselors and social workers. Students need to be healthy — mind and body — to learn. And when teachers are trusted, respected, get the resources they need to do their jobs well and have a voice in classroom decisions, their students are the beneficiaries. Instead of setting us back by doing what doesn’t work — which could double or triple the number of “improvement required” schools — HISD needs to implement programs backed by facts. Parents and communities are telling us that is what they want. The HISD board needs to keep its banter behind closed doors and the governor needs to stay off Twitter, because the ship is finally steering in the right direction and that is where we should keep our focus.